What's your view on the Makelele, Gerrard and Lampard combo for Chelsea ten years ago? Jose Mourinho is making headlines this morning virtually everywhere you look after revealing that he and Chelsea tried everything they could to sign Steven Gerrard back in 2005. Mourinho revealed that he wanted to partner Steven Gerrard alongside Frank Lampard and Claude Makelele and I just wonder how good you think those three could have been together? Of course it's all by the by now but taking you back ten years ago you could see why he wanted to form that partnership. Imagine Makelele in the holding role and Gerrard and Lampard pushing forward in tandem? They would have been formidable! 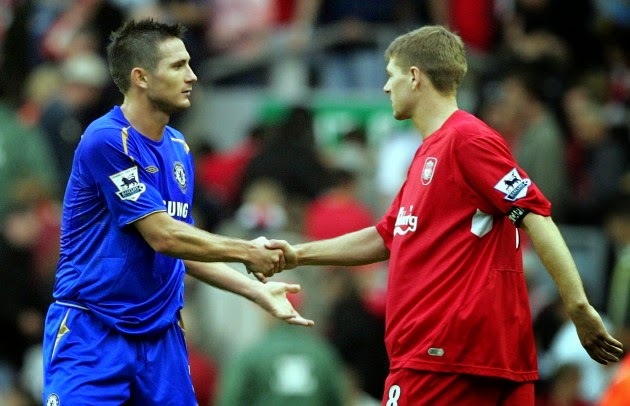 People have often spoken of the Gerrard/Lampard not working or they have the opinion that they couldn't play together because they are very similar. I personally believe that wouldn't have been the case at Chelsea because of the protection Makelele would have given the back four. Gerrard and Lampard would both have been able to express themselves and if anything I believe that they are slightly different. Gerrard has always been more of a play maker whereas Frank Lampard as we know, likes to get into the box. "I was dreaming of Claude Makelele, Gerrard and Frank Lampard. We were playing in an open triangle without a No 10, we were playing with Maka in front of the defenders and me and Mr Abramovich and Peter Kenyon were dreaming that. Thinking back it was clear that Gerrard was seriously contemplating leaving Liverpool and it looked like he was about to hand in a transfer request when we saw images of Liverpool fans burning his shirt outside the ground in addition to rumours of death threats etc. As a result, he stayed on Merseyside. What do you people think? Just how good do you think they could have been at Chelsea?